And still they come, all those beautiful albums we simply didn’t have time to review properly in 2014. A music reviewer for a European site told me they received 2,700 requests for metal album reviews during the year. Even with a battalion of reviewers it would be difficult to keep up with everything, and which metal fan would have time to read all those reviews and listen to all those albums? I have been picking out some of the very good albums I missed. Without going into detail about any of these five, I will confidently say they all would have been worthy inclusions on my Best of 2014 list. 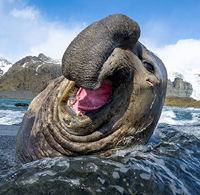 Accordingly they all receive the Elephant Seal of Approval. By the way, his stage name is Putrid Seal of the Apocalypse. The noble mammal on the left, so much more dignified and graceful than the Mammal on Metal State, proudly confers its Elephant Seal of Approval on five more outstanding albums of 2014. This unique seal confirms that all of the albums would have rated 4 or more out of 5 if the other Mammal had had enough time to review all of them in a year noteworthy for about three good metal releases every day, no kidding. On the Metal State scale, a score of 4 or higher puts an album in the top 3% of everything released in 2014. In short, any of these albums would have been a more than worthy inclusion on any sensible Best of the Year list. Following on from my post on More Goodies of 2014 on 29 December, meet five more outstanding albums that we didn’t have time to review or include in our Best of 2014 lists. These albums not only carry Mammal’s Elephant Seal of Approval, I’m damn sure they would all have rated at least 4 out of 5 if I’d been able to spend enough time with them to do them justice in full reviews. On Metal State, any album that scores 4 or more is in the top 3% of albums we receive. That should be a clear indication of just how good this selection is. And tomorrow we’ll meet five more excellent albums of 2014 that you’d do well to try. If 2015 produces the same volume of high-quality metal as 2014, we’re going to have excellence spilling out of the top-floor windows in the Metal State office tower.